I soaked a large jar full of pebbles (from a river) in bleach water for a couple of years and the rocks came out super smooth and shiny when dried. I have tried to repeat this process again but am not having any luck with it this time. Have you ever heard of this and do you know if there is a certain ratio of water to bleach that works? Perhaps I put something else in the water the first time and caused a chemical reaction? 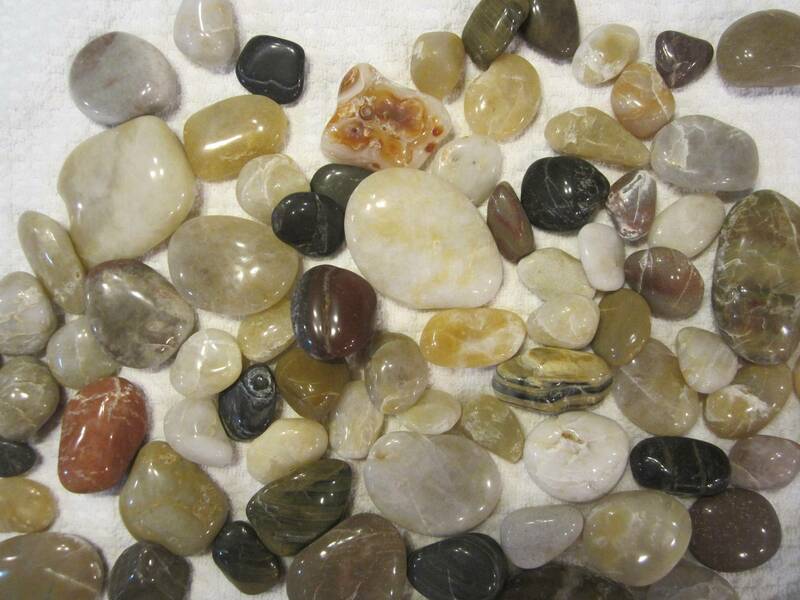 Here is a picture of the rocks that became smooth and shiny after a couple of years in water with bleach added for keeping the water clean and clear. And a picture of the rocks I have done the same to for a year. An interesting note is that fossils such as Petoskey Stones do not change at all. 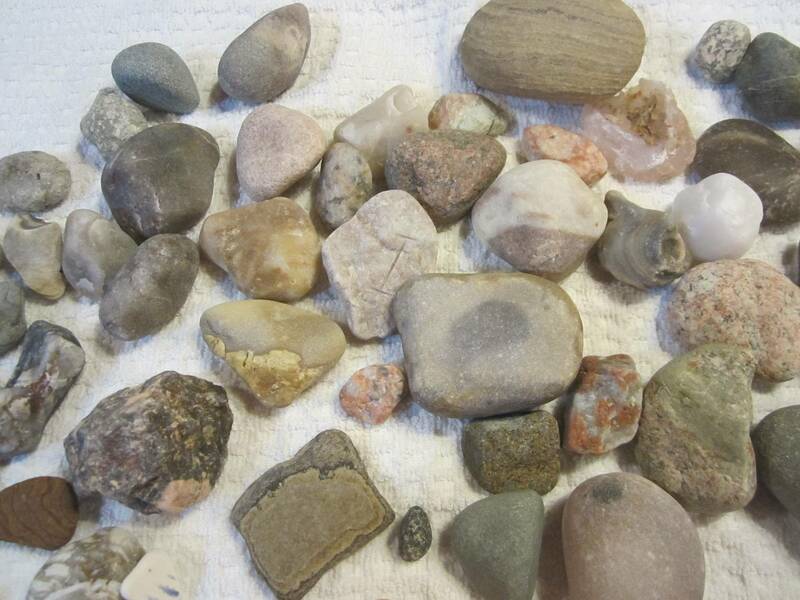 I've collected rocks and tumble polished rocks. It is not possible that just sitting in bleach water tumble polished the stones. You can leave the stones in bleach water till you die and they still won't get polished. The only explanation is that you bought polished stones and put them into the bleach water. Over a period of time you just forgot what type of stones that you started with. The other point is that "river rocks" (rocks smoothed in a river...) will look much smoother when wet because the water wets the surface and "hides" some of the surface roughness. So dry Petoskey Stones just look sort of mottled gray stones, but when wet the coral pattern shows nicely. The rocks become polished because of tumbling with grit, not because of chemicals. In the best case scenario the chemicals (either soda or bleach) will not do anything to the rocks and in the worst case scenario they will damage the rocks, forming microscopic pits and destroying any polished surface. Leaving rocks for prolonged times (years???) just seems absurd to me. I soaked a large jar full of pebbles (from a river) in bleach water for a couple of years and the rocks came out super smooth and shiny when dried. Maybe they were polished to begin with and you just don't remember? The rocks in the first picture look tumbled. See that irregular shaped white-orange rock in the top middle? Bleach will never do that. This is tumbled. Not the answer you're looking for? Browse other questions tagged everyday-chemistry minerals or ask your own question. Why does bleach feel slippery? What are the chemical process responsible for the warping of wood? What is the chemical reason talc is used in water-based paint and not in solvent based paint? Testing for asbestos using readily available chemicals and tools?